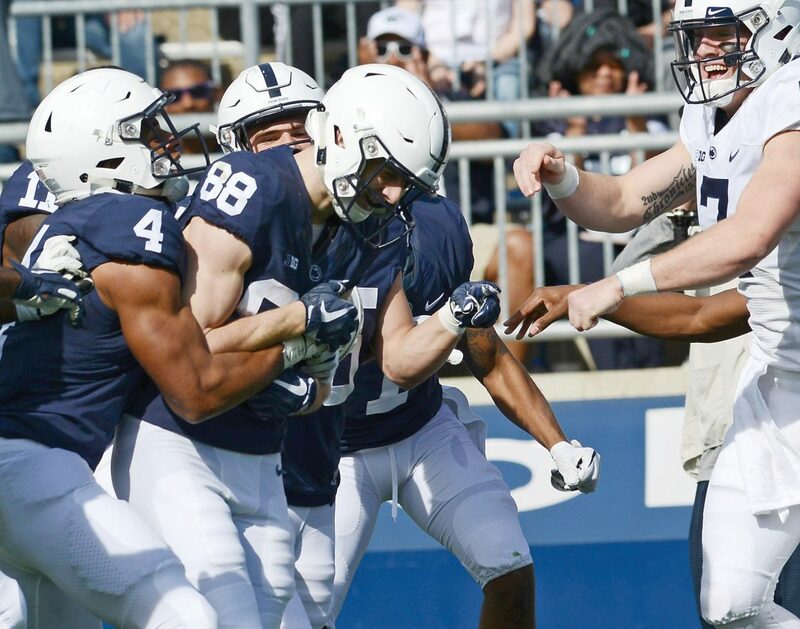 04/13/19 Patrick Waksmunski / Blue-White / Penn State wide receiver Dan Chisena (88) celebrates his new scholarship granted by head coach James Franklin after his TD reception. 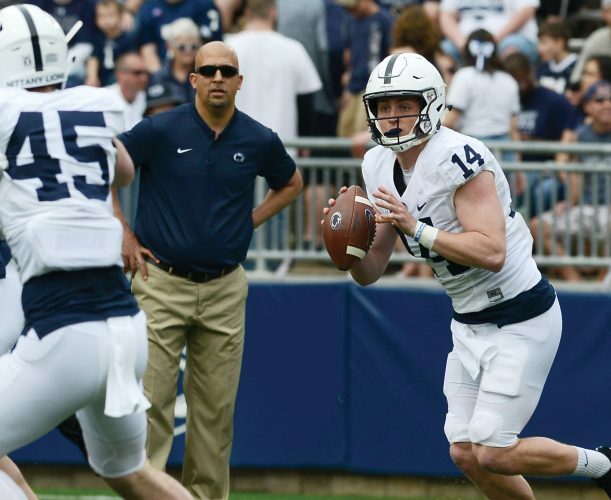 UNIVERSITY PARK — College teams across the country have taken to trying to one up each other when it comes to finding cool ways to put walk-ons on scholarship, and Penn State came up with a dandy during Saturday’s Blue-White Game. Late in the third quarter, quarterback Will Levis let fly a deep pass down the right sideline that speedy fifth-year senior wideout Dan Chisena hauled in for a 59-yard touchdown. That set off a fantastic scene as players from both sides ran and mobbed Chisena on the field to celebrate with him. Chisena, who runs a 40-yard dash in the 4.3s, was on scholarship with the track team, but he decided he wanted to return to football. “Since I left I just really missed football, and it was literally nothing to do with track,” Chisena said. “I loved my time over there, I love running track and competing with those guys. I miss those guys. But there was just a pull for me to go back and give football another try. Last week, Franklin surprised redshirt junior walk-on receiver Isaac Lutz with a scholarship. Franklin said Lutz had the most game reps of any player who wasn’t on scholarship. “Isaac’s just been one of these guys that’s very athletic, comes from an athletic family. … Where he really kind of earned his scholarship was last year on special teams,” Franklin said. Penn State great Matt Millen, broadcasting the game on BTN, was introduced to a standing ovation from the crowd after the first quarter. Millen had a heart transplant four months ago and has been an inspiration to many as he’s been able to recover quickly and get back in the broadcast booth. “For what he’s been able to overcome both physically and mentally, what he means to this university, what he means to his family and community is just special,” Franklin said. 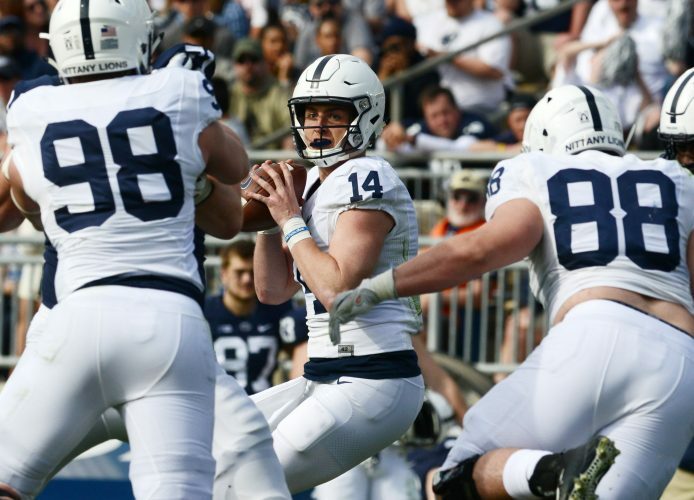 Dropped passes were a big problem for the Lions last season, and the Blue-White Game got off to a rough start as two of PSU’s best receiving targets had drops on the opening series. Tight end Pat Freiermuth initially had control of a short pass on second down before dropping it, then KJ Hamler dropped a pass in traffic over the middle on the next play. “Too many drops on offense,” Franklin said Saturday, repeating what he said many times last season. The Lions’ annual spring awards were given out at halftime. The Red Worrell Award (offense) went to lineman Michal Menet; Jim O’Hora Award (defense) to end Yetur Gross-Matos; Coaches’ Special Teams to Jonathan Sutherland; Frank Patrick Total Commitment to punter Blake Gillikin, offensive lineman Will Fries and running back Nick Eury. Central product Alex Hoenstine was on the sideline but not dressed for the White team. He was dinged up in practice two weeks ago and is in the concussion protocol. New Lady Lion basketball coach Carolyn Kieger was introduced to the crowd in the first quarter. At halftime, she took part in the punt catching contest. She caught her punt and ran it back, with the encouragement from Franklin, and she hammed it up for the crowd before leaping over the goal line. Penn State picked up two recruiting commitments Saturday, which is typical for a Blue-White Game. The top-rated defensive tackle in Indiana, Cole Brevard (four stars), and Virginia offensive lineman R.J. Adams (three stars) committed to the Lions.